The best you can hope for is to be remembered. This year marks the 20th year since Big Dink’s death. And when we gather for Father’s Day 2018, he’ll be very much “alive” in memories. There will be wads of damp Kleenexes. Rarely do we get through those remembering-Granddaddy sessions that we don’t have to dab the corners of our eyes—some from laughter, some from sweet memories. Living across the street from my folks gave our children a chance to have daily experiences with their grandparents. Alan, Emily and Eric got to enjoy their granddaddy’s semi-retired and retired mellow years. He didn’t go to the office, but he never stopped working. Neighbors teased that he caught pine cones on their first bounce. Big Dink was a stickler about his yard. While there was a riding Snapper in the shed, he preferred pushing a lawn mower for the exercise. His funeral home director’s days were filled with starched shirts and neckties, but he wasn’t afraid to get dirty and sweat. In fact—when he’d finish in the yard—he’d head to the laundry room, where he’d strip off his sopping, nasty clothes and streak to the shower. When he came back clean and clothed, Mother would typically have an egg-salad sandwich, chips, some carrot sticks and a glass of ice water waiting. All these years later, Alan does a perfect imitation of his granddaddy rattling the ice in a dimpled, green plastic tumbler. Shaking a glass, Alan says, “Granddaddy says that makes the water colder.” And when he rattles it some more, everyone nods and laughs. There’s a sandwich shop across the street from the office where Eric and I work. About once a week, he and I order egg-salad sandwiches and reminisce about those days on the corner of Ninth and Persimmon streets. I can almost hear the sucking sound Big Dink and Margie’s hollow-core back door made when we opened it to step into their kitchen. Invariably, Mother would scramble to her feet. “Sit here,” she’d say, “while I make you and the kids a sandwich.” And my dad would rattle his glass and wipe the egg salad off his moustache. Emily likes to tell the little-girl story about how she and her cousins, Morgan and Sail, loved to pile up in the same bed at their grandparents’ house. Once, in the middle of the night, the three decided it was too hot. Emily tiptoed into the hall and pulled the thermostat down to a polar-bear setting. The next morning, Granddaddy came out of his room with a blue nose and goosebumps. You knew he was in his mellow years when the famous penny-pinching grandpa laughed the loudest. That story always gets hands reaching for the Kleenex. Eric was the last of the six grandchildren. 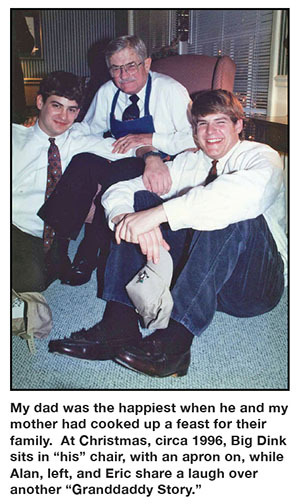 His grandmother nicknamed him “PJ,” for biblical disciples Peter and John—big and strong, but tender-hearted. One day, Eric was in his granddaddy’s woodworking shop when Big Dink asked him to step on a board. With a pencil, he traced Eric’s foot for a shoeshine-box top pattern. Before my dad died, he made more than 200 of those boxes for sales associates in our company. And on the bottom of Eric and Alan’s shoeshine boxes, he wrote his birthdate … so that they’d never forget Feb. 8, 1922. Pass that box of tissues.